Sole survivor of a suicide pact, Ang has fallen into an underground music scene obsessed with the idea of the end of the world. But when the end finally does come, Ang and her friends don't find the liberation they expected. Instead, those still alive are starving, strung out and struggling to survive in a world that no longer makes sense. As Ang navigates the world's final days, her emotional and physical instability mix with growing uncertainty and she begins to distrust her perception in a place where nothing can ever be trusted for what it seems to be. Bleak and haunting, "PostApoc" blends poetry and punk rock, surrealism and stark imagery to tell the story of a girl wavering at the edge of her sanity. Reading PostApoc I felt like I was rediscovering the Post-Apocalyptic genre. It was completely new and fresh… even though “fresh” might not be the word, since the novel dwells into the worst darkness and horror I’ve ever read. I even thought of qualifying PostApoc as a horror novel, but this would be beside the point: PostApoc leaves you sometimes terrified, disgusted, or despaired, but this is merely an unfortunate side-effect of the protagonist’s story. First of all, PostApoc is not about heroic survival. Novels like I Am a Legend by Richard Matheson made me used to heroes putting so much efforts into staying alive by showing resilience, wit and an impressive will to live. In these stories, “survival” means to fight. Well, there’s nothing as such in PostApoc: Ang is simply too wasted to fight for anything. She is the sole survivor of a suicide pact and coping with her memories became her everyday challenge. Alcohol, drug, music concert, and sleeping in dumb her fears and anguishes down. This makes PostApoc‘s world small and closed, even claustrophobic: it revolves mainly around Ang’s house, if not only in Ang’s mind. What made PostApoc so fascinating to me is how the end of the world came to challenge Ang’s beliefs. Before “the End” as they call it, she and her friends had embraced nihilism: everything was dark and pointless, death was an ideal. It was a way of life, an aesthetic choice, more than an actual perception of reality. The whole novel is about how the happening of The End gives new meanings to Ang’s previous beliefs. Death, she realizes, is only about loss. The collapse of society is merely about hunger, disease, stray pets gone feral, empty streets, lack of water, soap, clothes, or anything to keep up a basic level of hygiene. PostApoc excels at making you uncomfortable and disgusted that Ang’s world of filth could stick to your fingers through the pages of the book. Ang’s core identity is shaken by the End. Even though she and her friends try to cling to the past and their old habits of drug and alcohol and music shows, the End comes to shatter their efforts. Ang is left to reconstruct a “healthy” and genuine relation to Death and to explore her memories. 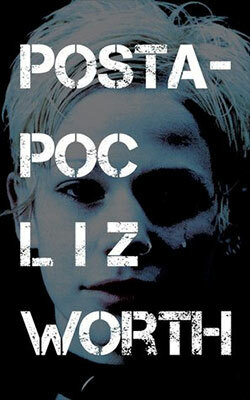 Besides the story, I was totally taken away by Liz Worth’s beautiful style and incredible talent. Poetry and violence come together to give an extreme intensity to this novel. Everything is alive, raw, bleak and despaired. The author always finds the exact words and images to bring you to this world. “On Shelbourn Street a house shrugged and yawned, its front door wide open and an old red carpet flashed from its inside like a tongue. Its frame was aloof and unattached and right there for us to take, at least for a night. More often than not, you start wondering if the End could be a product of Ang’s insanity, a bad trip, or a nightmare. The poetic writing certainly makes you feel that reality is a bit warped. But all of a sudden, you’re snapped back to the gritty details of reality. PostApoc was an amazing read. It is really intense and sometimes requires you to put the book down and take a deep breath. It’s dark, claustrophobic and full of despair, but it is also beautiful. The writing is spectacular and Ang’s slow questioning about her life and beliefs are truly fascinating.